Russia’s upcoming APEC Chairmanship indicates that Moscow should pay more attention to the Asian region to integrate with Asian-Pacific community. The question of whether or not Russia is an Asian country is a little contrived. One look at the map is enough to see that Russia has the continent’s largest landmass, a large portion of the Asian coast, and Asia is home to Russia’s largest trading partners, most importantly China, which has recently become Russia’s most important partner in terms of trade turnover. Nevertheless, many in Asia still consider Russia to be not quite Asian. Perhaps this is because ethnically, religiously, culturally, and politically, Russia has traditionally gravitated more towards Europe than Asia. Or maybe it’s because the bulk of the Russian population lives in the western part of the country. But this feeling is more likely the result of Russia’s place on the sidelines of the emerging Asia-Pacific community. As a result, Russia’s potential as an Asian power remains largely unrealized. The Russian government, led from Moscow in the heart of European Russia, has been too slow and inconsistent in rebuilding the economy of its eastern regions, and doesn’t create the required incentives for foreign investment – or even Russian investment for that matter. The Asian part of Russia faces especially acute issues in infrastructure, small business growth and migration. In international affairs involving the region, Russian doesn’t always manage to grasp the logic of its Asian neighbors, which occasionally results in unfortunate miscalculations. That said, these Asian neighbors are not quite beyond reproach either. Some of them treat Russia as if the Cold War never ended; others view the country as nothing but a source of commodities from which to pump the resources they need – preferably on the most preferential terms. Still others believe that developing relations with Russia can be postponed until better times because the priorities of Asian foreign policy lie elsewhere at the moment. Russia’s forthcoming chairmanship of the Asia-Pacific Economic Council (APEC) in 2012 presents a unique opportunity to take a new look at Russia’s prospects for integration into the Asian-Pacific community. The Russian leadership is treating the upcoming chairmanship with the utmost importance. Recent months have seen meticulous preparatory work to flesh out the agenda for Russia’s chairmanship with real content; considerable funds have been invested in preparing facilities to host events. Russia’s chairmanship of APEC should be the starting point for developing multilateral cooperation in the Asia-Pacific region on a whole range of issues that are key for the country. First of all, there is the liberalization of trade and investment and regional economic integration. Certain steps in this direction have been taken this year under the chairmanship of the United States, and Russia is ready to move forward on this path towards free trade and investment in the region. Whereas the recent summit in Honolulu mainly discussed the current issues of trade liberalization, next year it would make sense to focus on the long-term outlook for integration of APEC economies, including taking into account CIS integration initiatives begun by Russia, and on preventing financial and economic crises in the region and globally. APEC countries, which today account for the bulk of global economic growth, have a special responsibility for optimizing global mechanisms for regulating economic development. Strengthening food security is another priority for 2012. This issue will likely become central to global policy in the 21st century, and APEC’s role in this can’t be overestimated. However, multilateral cooperation among the region’s countries is only just beginning in this area. Russia lacks a coordinated regional approach to food supply security risk management. The time has clearly come to deal with matters such as reducing food price volatility, cutting losses resulting from transportation of agricultural products within the region, and coordinating national efforts to improve yields of basic crops. These food issues are closely linked with environmental issues and preserving APEC’s biodiversity. Russia’s other priority is developing the region’s transportation and logistical capacity. By virtue of its geographic location, Russia is a country of transit between Asia and Europe, but its intercontinental transport corridor capabilities are still far from fully utilized. Russia needs to accomplish a great deal domestically in this area, but the international dimension is no less important. 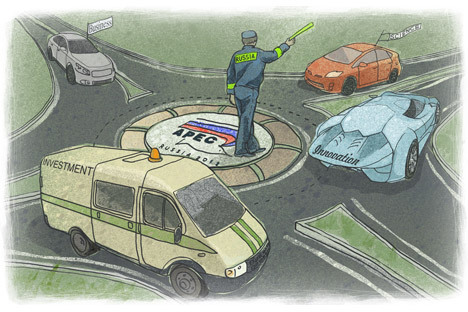 Cutting costs and wait times at border crossings is crucial along with implementing major infrastructure projects such as upgrades of ports, airports, and transport corridors through private-public partnerships are all matters we hope will be discussed both during the year and at the APEC summit to be held in Vladivostok. The APEC summit also represents an opportunity to promote an innovation agenda for Russia and the entire APEC region. How can Russia ensure the most effective forms of interaction between science, business, and government to promote new technologies? How can it bring cooperation among innovation centers, universities, research institutions, science towns, and innovative territories to a new level? How can it increase geographic mobility for scientists, educators, and innovators and ensure protection of intellectual property rights in the region and reduce the turnover of counterfeit goods? These kinds of questions are becoming increasingly important not only for Russia, but also for its neighbors on the Asian continent. Igor S. Ivanov is President of the Russian Council on International Affairs. From 1998 to 2004 he served as Minister of Foreign Affairs. In 2004 he took the position of Secretary at Russia's Security Council. He particpated in several UN General Assembly sessions and also served as Russia's ambassador to Spain.